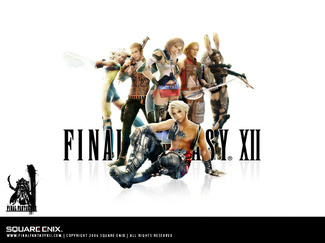 I finally finished Final Fantasy XII. This is probably the first Final Fantasy where I ended up trying to do all sorts of unnecessary and somewhat hard to find side quests. I suspect mostly because of the new combat system, which is a lot like combat might be in a MMORPG and no doubt a lot of the engine came from the work put into Final Fantasy XI. Exploring and moving through the environments was more engaging and interesting, because combat just happens without you having to enter a special game mode. Which makes moving between places feel more natural. In this new combat system, you control one of your three party characters and can switch back and forth at will. The other two characters are set to execute commands in a prioritized list, using what Square Enix calls gambits. So you might set Penelo to heal whenever someone gets low on HP, but otherwise cast haste and then finally attack if none of those spells are necessary. Because I ended up doing a lot of exploring and side quests, I did get all of my characters to level 99. That's the first time I've done that in a Final Fantasy. It did help that you can equip accessories that will increase your experience awarded. The party I ended up using most was Ashe, Penelo, and Fran. That provided a pretty good mix of close-combat, healing, and ranged-attack. Bathier wasn't particularly interesting to use with his guns. Vaan is sort of a basic all-around character, and Basch was my pole-arms fighter. In Final Fantasy XII, you sort of have complete control over how your characters end up developing because you can purchase skills on the License Board. In the beginning it makes sense to focus characters on different skill sets so you have a good combination in your party. Later on, it is possible to purchase all the licenses and the characters are then differentiated by their natural talent (i.e. stats). Final Fantasy XII is set in a world called Ivalice. It's a very rich world, with good back story and everything was made consistent. There are a number of different races, the most interesting being the Viera who are an apparently all-female race of rabbit-like humanoids that live in the woods, separate from the rest of civilization. Only a very few leave the wood to live among the other races. I'm not entirely sure how the Viera reproduce. This isn't made clear in the game, but there is one side quest where a Viera and Hume begin a relationship although it seems clear the two species cannot reproduce with each other. The graphics of Final Fantasy XII aren't all that different than that found in Final Fantasy X. Perhaps a bit more polished, and the world environment is certainly different because it is fully 3-D and can be explored that way. I do feel like the music was bit less memorable and more background than thematic though. The environments were large, and you tended to spend quite a bit of time in them just since you have to travel by foot, and the music was composed to match. The story was good, and typical of what you expect from the higher-numbered Final Fantasy games. Interesting, fully fleshed out, but also somewhat grounded and less fantastical than the ones put together for the earlier stories. For me, this is a bit unfortunate because it doesn't have the feel of a sweeping epic or provide me with an intense emotional connection.